A deed poll issued by Deed Poll Office will be accepted as documentary evidence of a change of name by any U.K. government department (including HM Passport Office and the DVLA), any U.K. public agency, public corporation or other public body, any U.K. company or organisation, and any British diplomatic mission overseas. When it happens that anyone doubts the authenticity of one of our deed polls, it is normally due to staff being uninformed as to the legal requirements of a deed poll, and it is our policy to support our clients and liaise with the body in question until the deed poll has been accepted. If it ever happens that one of our deed polls is not accepted by any U.K. government department, any U.K. public agency, public corporation or other public body, any U.K. company or organisation or any British diplomatic mission overseas, we’ll give you a full refund, subject to conditions 1.1–1.2 below. Occasionally, our clients have had problems with a deed poll being accepted, because a record holder (or their staff) have not understood what a deed poll is, or what the legal requirements are for the document to be valid. Note that we have never yet had to give a refund under our acceptance guarantee. 1.2.1. Record holders outside U.K. The acceptance guarantee only applies to acceptance of your deed poll by U.K. government departments, U.K. public agencies, public corporations and other public bodies, U.K. companies and organisations, and British diplomatic missions overseas. This includes British Embassies and High Commissions, and any other British diplomatic mission abroad, but does not include any other body outside the U.K. The acceptance guarantee does not apply to foreign nationals — whether resident in the U.K. or not. Foreign nationals should check the requirements of their country of origin before ordering a deed poll, but we are unable to advise on or guarantee the outcome of using a deed poll to change your name. For a child application, you must obtain the necessary consent from everyone with parental responsibility for the child. If you do not obtain this consent (in writing), your deed poll will not be accepted. The acceptance guarantee does not apply in this case — it is your own responsibility to determine who has parental responsibility for the child, and to obtain the required consent. We give information about who will have parental responsibility based on the information you provide in your application, but due to the limitations of that information and the complexity of the law, we cannot guarantee the information we provide will be correct, and nor should the information we give you be interpreted as legal advice. The acceptance guarantee does not apply if you supply us with false or inaccurate information. We will not be held responsible for a deed poll which is incorrectly signed, dated, or witnessed, and the acceptance guarantee does not apply in this case. We provide instructions on how to execute your deed poll correctly when we send you your deed poll documentation, but it is your responsibility to follow those instructions correctly. The acceptance guarantee does not apply if your chosen new name is rejected by any record holder because they deem the name itself or the reason for changing your name to be unacceptable. The fact that Deed Poll Office accepts your name is no guarantee that anyone else will. The acceptance guarantee does not apply if a record holder requires additional documentary evidence and your deed poll is rejected. You will need to update your documents in a certain order, that is, to obtain additional documentary evidence in your new name so you can provide it to the record holder that requires it. The acceptance guarantee does not apply if you are currently detained under the Mental Health Act and your doctors have judged that you do not have mental capacity to make a decision for yourself about changing your name. Full details of our current prices are listed in our price list. Payment is required in full before we will start processing your order. Where payment is by debit or credit card, payment is deemed to have been made when we obtain authorisation from your debit / credit card company. Where payment is by PayPal, payment is deemed to have been made when we receive the funds into our PayPal account. Where payment is by money transfer or BACS, payment is deemed to have been made when we receive the funds into our bank account. Where payment is by cheque, payment is deemed to have been made when your cheque has cleared (please allow 3 working days for cheque clearance). Where payment is by postal order, building society cheque or banker’s draft, payment is deemed to have been made on its receipt. We will make clear in the second e‑mail when we expect to despatch your application. We aim to process your application and despatch the order within 2 working days of receiving it. Where payment is made by money transfer or cheque, we’ll process your application when we have received the funds into our account. Once we get confirmation of payment — likewise — we aim to despatch the order within 2 working days, or the same working day when using the priority service. This is not a guarantee of the time it will take to process your application, and processing may take longer if your application is not straightforward in some way, or we require further information. However, we’ll notify you (by e-mail) when this is the case. Deed Poll Office uses Royal Mail as the carrier for all deed poll documentation posted to addresses within the U.K., Isle of Man, and Channel Islands, and for any other correspondence when it cannot be carried out by e‑mail. We will deliver your deed poll documentation as per the delivery method you request in the application form. For documents / correspondence sent outside the U.K. we also offer the option of sending by courier. However we do not and cannot guarantee which courier we will send your documents with. We will choose a suitable courier based on the destination country, current prices, and any other factor which we think is appropriate. Deed poll documentation is delivered in board-backed envelopes. For your privacy, there is no indication of the contents of the envelope from the outside, unless we are sending the documents to a prison, or to an address outside the U.K., in which case the envelope will show our company name and return address. If you place an application for a deed poll with Deed Poll Office, you can cancel your order and obtain a full refund provided we have not begun to process your application. To cancel your application, send an e-mail to applications@deedpolloffice.com, quoting your application reference. Because we prepare customised deed poll documentation specifically for you — once we’ve begun processing your application, we cannot offer you a refund. Under regulation 28(1)(b) of the Consumer Contracts (Information, Cancellation and Additional Charges) Regulations 2013 , a deed poll would be classed as goods made to the consumer’s specifications or which are clearly personalised, and thus it’s exempted from the right to cancellation under those regulations. This means that you cannot return your deed poll documentation to us for a refund. This doesn’t, however, affect your right to a refund under to the terms of our acceptance guarantee. We’ll notify you by e-mail when we’ve begun processing your order, and we’ll make it clear at this point that the right to cancel your application has expired. If we make a mistake on your deed poll we will correct the mistake and issue new deed poll documentation the same working day, despatched by the same delivery method you originally requested, and entirely without charge, provided the information you supplied to us in your application was correct. If a mistake was made on your deed poll due to incorrect information that you supplied to us in your application, for example a typographical error, we will issue a replacement deed poll at the reduced rate of £ 9.00 for adult applications, and £ 6.00 for child applications. You will need to return your original deed poll to us in order to qualify for the reduced rate. The corrected deed poll will be processed and despatched within the usual processing times, as though it were a new application. The reduced rate does not affect the pricing for duplicate originals or delivery. This reduced rate applies only for genuine mistakes, and not in any other case, for example, if you change your mind about your change of name, or you need additional information on the deed poll. The reduced rate also does not apply if you executed (signed, dated and witnessed) your deed poll incorrectly. We may require evidence that the mistake was genuine, and we reserve the right to refuse a request for a reduced rate deed poll if we believe the mistake is not genuine. In the event that your order does not arrive after 10 working days we will resend the order without charge. This is the limit of our liability. All refunds will be made to the debit or credit card on which the original purchase was made, within 30 days. If the original payment was by cheque or postal order, we will require you to supply the information we need to reverse the payment. We will normally make the refund using the same method as the original payment. If you want to make a complaint, you can write to us by e-mail at contact@deedpolloffice.com. We aim to respond to any e-mail as soon as possible, but at most within one working day (our working hours are 9.00 a.m. to 4.30 p.m.). Please quote your application reference in any correspondence, if you have one. Deed Poll Office shall have no liability to you for any failure to deliver goods you have ordered or any delay in doing so or for any damage or defect to goods delivered that is caused by any event or circumstance beyond its reasonable control. The Deed Poll Office site is provided by Deed Poll Office without any warranties or guarantees. The nature of internet communications means that your communications may be susceptible to data corruption, interception and delays. Deed Poll Office shall not be responsible for any detrimental reliance you place on this site or its contents. Deed Poll Office is providing this site and its contents (including any downloadable data or software) on an "as is" basis and makes no representations or warranties of any kind with respect to this site or its contents and disclaims all such representations and warranties, whether express or implied, to the fullest extent permitted by applicable law. 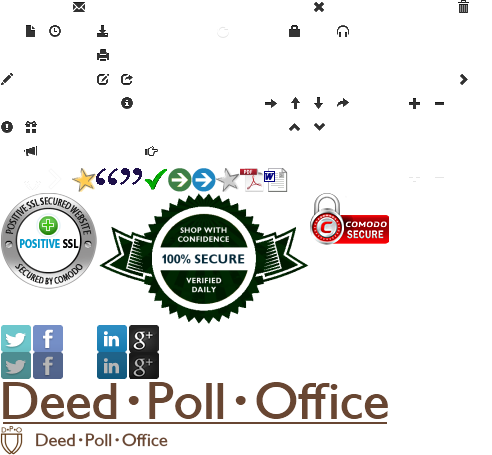 In addition, Deed Poll Office makes no representations or warranties about the accuracy, completeness or suitability for any particular purpose of the information and related graphics published in this site or that any software or the server that makes it available are free of viruses or other harmful components. If Deed Poll Office is informed of any inaccuracies in the material on this site we will attempt to correct the inaccuracies as soon as we reasonably can. To the full extent allowed by applicable law, you agree that we will not be liable to you or any third party for any consequential or incidental damages (including but not limited to loss of revenue, loss of profits, loss of anticipated savings, wasted expenditure, loss of privacy and loss of data) or any other indirect, special or punitive damages whatsoever that arise out of or are related to the Deed Poll Office site. Although Deed Poll Office aims to offer you the best service possible, Deed Poll Office makes no promise that the services at the Deed Poll Office site will meet your requirements. Deed Poll Office cannot guarantee that the service will be fault free. If a fault occurs in the service you should report it to Customer Services by e‑mail to help@deedpolloffice.com and we will attempt to correct the fault as soon as we reasonably can. Your access to the Deed Poll Office site may be occasionally restricted to allow for repairs, maintenance or the introduction of new facilities or services. Deed Poll Office will attempt to restore the service as soon as it reasonably can. The Deed Poll Office site contains external hyperlinks (external links). These external links connect you to websites of other organisations which are not our responsibility. We have used our reasonable endeavours in preparing this site and the information included in it is done so in good faith. However, we have no control over any of the information you can access via other websites. Therefore, no mention of any organisation, company or individual to which this site is linked shall imply any approval or warranty as to the standing and capability of any such organisations, company or individual on the part of Deed Poll Office. Deed Poll Office makes no promise that materials on the Deed Poll Office site are appropriate or available for use in locations outside the U.K., and accessing the Deed Poll Office site from territories where its contents are illegal or unlawful is prohibited. If you choose to access this site from locations outside the United Kingdom, you do so on your own initiative and are responsible for compliance with local laws. The Deed Poll Office site and the service provided by us — including any documents or correspondence we prepare for you or send to you — are available in English only.